The concept of the Saptamatrikas or Seven mothers have existed since the Indus valley civilisation. Seals have been found with seven feminine deities. The seven mothers find mention in the Rigveda, the Puranas and the Mahabahrata. By the fifth century they came to be called as Tantric Goddesses. The Mahabharata describes them as dark in colour and staying in ”peripheral areas” and that they are associated with Skanda or Kumara, son of Lord Shiva. They later came to be associated with the sect of Lord Shiva himself. Their sculptural representation in the 1st to 3rd century happened in stone. During the Gupta period(3rd to 6th century C E) folk images of the matrikas were made. Later rulers made Skanda as their model and the foster mothers became”court goddesses”. Many dynasties devoted rock-cut sculptures to the matrikas. Like at Parhari in Madhya Pradesh. Temples of the Western Ganga dynasty (350-1000 A.D) and sculptures of the Gurjara-Prtiharas (8th to 10th century A.D) and Chandella dynasty (8th to 12th century), Chalukya dynasty (11th to 13th century A.D). Initially the matrikas were considered dangerous but later took on a protective role. They are mostly depicted in lalitasana posture. 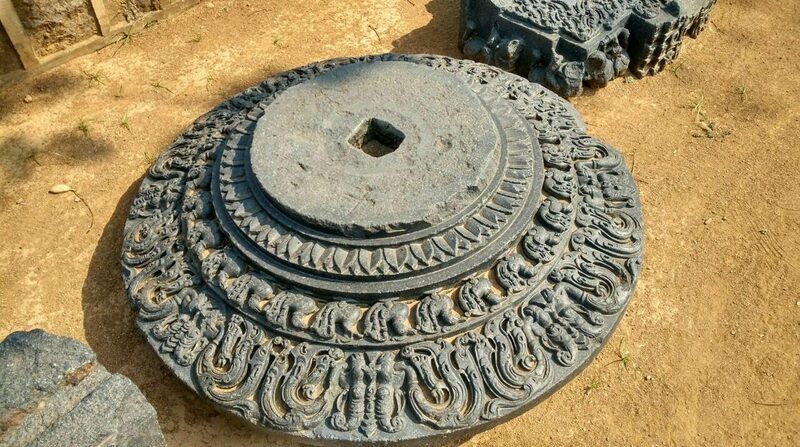 According to a legend the matrikas were created to assist Lord Shiva in a battle agianst Andhakasura as per the Isaanasivagurudeva paddhati. The matrikas are the powers of the associated devas. 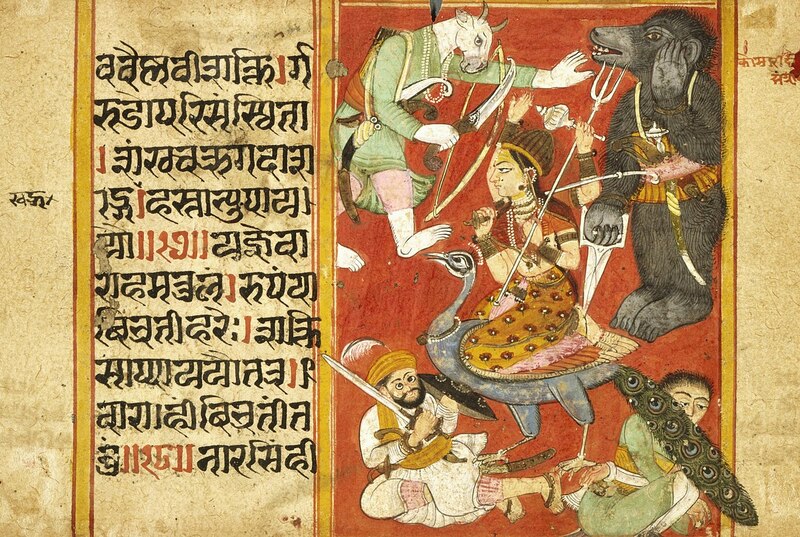 In Shaktism they are believed to have assisted the Devi in her fight against demons like Raktabija. The saptamatrikas are Brahmani,Vaishnavi, Maheshwari, Kaumari, Varahi, Chamunda and Indrani. Vaishnavi, Varahi, Indrani and Chamunda, National Museum, New Delhi. Vaishnavi : From Vishnu; is described as seated on Garudaand having four or six arms. She is depicted holding Shankha (conch), chakra (Discus), mace and lotus and bow and sword or her two arms are in varada mudra (Blessing hand gesture) and abhaya mudra (“No-fear” hand gesture). Like Vishnu, she is heavily adorned with ornaments like necklaces, anklets, earrings, bangles wearing a cylindrical crown called kiritamukuta. Maheshwari : From Shiva; Maheshvari is depicted seated on Nandi (the bull) and has four or six hands. The fair complexioned, Trinetra (three eyed) goddess holds a trishula (trident), damaru (drum), Akshamala (A garland of beads), panapatra (drinking vessel) or axe or an antelope or a kapala (skull-bowl) or a serpent and is adorned with serpent bracelets, the crescent moon and jatamakuta, a crown formed of piled, matted hair. Kaumari : From Skanda or Kumara;the god of war. Kaumari rides a peacock and has four or twelve arms. She holds a spear, axe, a shakti (power) or Tanka (silver coins) and bow. She is sometimes depicted six-headed like Kumara and wears the cylindrical crown. In Tamil Nadu, Karumari Amman is a favored deity. Varahi : From Varaha; the boar-headed form of Vishnu or Yama – the god of death, has a boar head on a human body and rides a ram or a buffalo. She holds a danda (rod of punishment) or plough, goad, a vajra or a sword, and a panapatra. She wears a crown karaṇḍa mukuṭa with other ornaments. Chamunda : Chamundi and Charchika is the power of Devi (Chandi). She is very often identified with Kali and is similar in her appearance and habit. The identification with Kali is explicit in Devi Mahatmya. The black coloured Chamunda is described as wearing a garland of severed heads or skulls (Mundamala) and holding a damaru (drum), trishula (trident), sword and pānapātra (drinking-vessel). Riding a jackal or standing on a corpse of a man (shava or preta), she is described as having three eyes, a terrifying face and a sunken belly. Indrani : From Indra; the Lord of the heaven. Seated on a charging elephant, Aindri, is depicted dark-skinned, with two or four or six arms. She is depicted as having two or three or like Indra, a thousand eyes. She is armed with the vajra(thunderbolt), goad, noose and lotus stalk. Adorned with variety of ornaments, she wears the kiritamakuta. Another eighth Matrika is Narsimhi or Narasimhika, Prathyangira, and Atharvana Bhadrakaali, is the power of Narasimha (lion-man form of Vishnu). She is a woman-lion goddess who throws the stars into disarray by shaking her lion mane. Ashtamatrika is revered in Nepal. Saptamatrika panel, National Museum, New Delhi. Mantra ratnakara decipting Matrikas, Wood and multi-layered paper,Nepal. Saptmatrikas,terracotta, Maurya period, National Museum, New Delhi. Saptamatrikas flanked by Shiva on the left and Ganesha on the right, Los Angeles County Museum of Art, U.S.A, 9th century. Goddess Durga leads the eight Matrikas in battle against demon Raktabija. Folio, Devi Mahatmya, Nepal, 18th century. This entry was posted in Ancient Indian history, art history of India, asian art, Saptamtrikas and tagged art history, saptamatrikas, sculpture, Temples on April 16, 2018 by historyreads.